....Sheer Ecstacy At Tema, Ho Lorry Stations Kumasi, Dec. 12 (Graphic) -- Amid the dead silence that was observed among Kotoko supporters and sympathisers in Kumasi after Asante Kotoko lost to Hearts of Oak in the CAF Confederation Cup final, supporters and sympathisers of Accra Hearts of Oak sang and danced in what looked like a carnival across the length and breadth of the city. In some places they were joined with brass band music to celebrate their team's historic victory. Drinking joints which used to be very busy even on ordinary Sundays were empty and without any fanfare. Many were residents who remained indoors till yesterday morning. 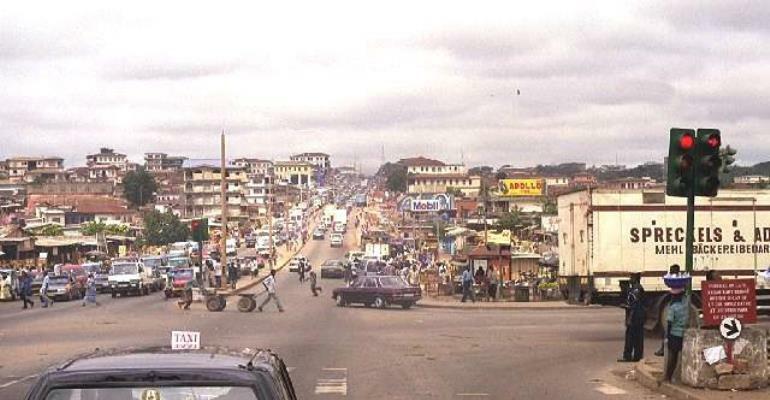 Looking at the slow pace of business activities on Manday morning, there were all indications that the victory of Accra Hearts of Oak over Kumasi Asante Kotoko had had a telling effect on the residents, as well as business activities in the Kumasi metropolis. Interestingly, while some supporters could not come to terms with the defeat, other Kotoko supporters saw the defeat as normal with matches in which case one side must win while the other lose. For this reason, some Kotoko supporters joined Hearts fans at some of the drinking spots and also in cars tooting their horns in celebration. Whatever the case, they felt both teams were from Ghana and so they could also join in the celebration. There were those who remained at the Kumasi Stadium after the match till as late as 10 p.m. Many supporters of Kotoko were yesterday spotted in groups along the streets and in front of their houses and shops discussing what might have accounted for their team's defeat. On the contrary, the sizeable Hearts fans in Kumasi could still be seen in their Phobian colours chanting the team's slogan, as well as tooting their car horns,especially when they met their fellow Hearts supporters. Some Hearts fans at the Asafo suburb of Kumasi, for instance, carried on their shoulders a coffin decorated in Kotoko colours while they sang dirges. • Players and officials of Confederation Cup champions, Hearts of Oak, received a rousing welcome from some 600 fans when they arrived in Accra yesterday. Wearing broad smiles and high shoulders, the team descended their bus at the beckoning of the fans who chanted,in earnest, the age-old 'arise, arose arisen...' refrain,among other songs. Indeed, the fans endured some four-hour wait in Accra, but when their idols emerged at 7: 15 p.m. none remembered the time lost. Sheer Ecstacy At Tema, Ho Lorry Stations Supporters of Accra Hearts of Oak last Sunday went into wild jubilation after the last penalty kick was expertly converted to ensure the club lift the Cup after the final leg of the CAF Confederation Cup at the Kumasi Stadium. The match ended 1-1 at the end of regulation time, after Kumasi Asante Kotoko as usual took the lead in the second half.But Hearts in the "Never Say Die' mood, fetched the equaliser late into the match to send the match into the penalty shoot-out. Hearts keeper, Mohammed Sanni made one save of the first five kicks while his counterpart from the Kotoko camp, George Owu also made a save for another batch of penalty kicks.The decider came when Kotoko's captain, Joe Hendricks' shot was saved by keeper Sanni with Hearts Michael Donkor finding the net to enable Hearts lift the Cup. Just after the kick, there was wild jubilation by enthusiastic Hearts supporters amid tooting of cars, taxis and tro-tro horns to herald the victory of the Phobians amid songs of "Phobia, Never Say Die, until the bones are rotten". At the Tema and Ho lorry stations in Accra, jubilant supporters clad in Hearts colours and waving flags, were joined by traders and shoppers to dance to music provided by cassette sellers and drum beating fans. Felix Kwashie, a lotto writer, said history repeats itself since it was Sir Cecil Jones Attuquayefio who led Hearts four years ago to lift the Champions League trophy and it was no wonder that he has again led Hearts to be the first to lift the Confederation Cup. Osei Ampadu from Koforidua said Hearts lived up to expectation and lived up to their motto that enabled them improve upon their first leg match in Accra a week ago to triumph over their arch-rivals in Kumasi. Some of the Kotoko supporters cursed their stars for allowing the cup to slip from their hands at their home grounds while others blamed their coach, Hans-Dieter Schmidt for letting them down when he substituted Charles Taylor when Kotoko were in the lead.